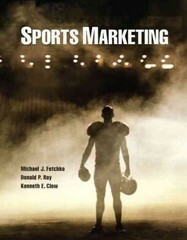 Sports Marketing 1 Edition Understand the business of sports through a practitioner’s perspective. Written from the perspective of those who’ve been actively involved in the sports business, Sports Marketing addresses business and marketing issues pertinent to sports as observed by the practitioners and scholars themselves. Through its extensive presentation of current information, this text also helps encourage readers to get actively involved and engaged in the process of sports entertainment.